Ok ya'll I know for sure when you start reading this one you're thinking what in the world can she say about this, Jeremiah ain't no bullfrog and I'm sure he doesn't have mighty fine wine. 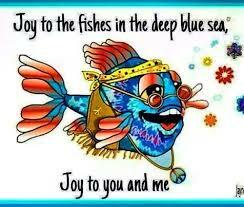 Well the Jeremiah's I know certainly aren't bullfrogs and they probably don't have mighty fine wine, but but let's just pretend today and go to the deep blue sea with Jeremiah and find some JOY! Since I don't have a clue what this song is about I turned to the trusty Mr. Google. What I found was a common interpretation of the writer's bullfrog is the prophet Jeremiah from the Bible and the song represents God's desire to unite all people in happiness. The bullfrog, with his distinctive call that stands out in nature, is God's voice. Holy Moly whether this is right or not, I LOVE it. I mean what a better time to write about this than right now with all that's going on in this country. What if this tiny little bullfrog could bring joy to the all the boys and girls, joy to the fishes in the deep blue sea and joy to you and me. This song has always made me happy or to stay in line with the song brought joy to my soul. Reading the words "if I were king of the world tell you what I'd do" made me stop a minute and wonder if I had that power to be king (or in my case queen) what would I do. OK since you asked here is what I would do. I would throw away all the hate, violence, abuse, sexual assault and war. Hate is such a strong word but unfortunately it's in this world so I would replace all the hate with JOY! Joy to the boy and girls and joy to you and me. I would replace all the violence, abuse, sexual assault and war with JOY too. Give joy back to the ones affected by violence of any kind, JOY back to that person abused or sexually assaulted and JOY back to people affected by war. Writing this I'm thinking all these things are so horrible, how in the world could a person ever have JOY in their heart. Getting joy back in your heart is hard but if I were queen and had the power I would make all the boys and girl, men and women, fishes in the deep blue sea have JOY, JOY, JOY down in their heart. I would have them all have the love of Jesus in their heart, down in their heart to stay. And if the devil doesn't like it, he can sit on a tack, sit on a tack and stay!!! Then I would be so happy, so very happy, that everyone has Joy, Joy, Joy down in their heart. Lesson today? Since I have you all singing about a bullfrog I think my lesson today will be for you all to google this song, turn it up loud and just let the JOY of the song take over. Let the joy take over your heart, let it bring peace where there is hurt and let any hate you have be replaced with JOY. Joy down in your heart, way down in your heart. Let the devil sit on a tack, sit on a tack and let him get STUCK!!! Once you feel all this joy I'm talking about, turn ole Jeremiah up one more time and "dance it out." Don't worry about who's watching, they're probably not anyway. JUST DO IT!! !